Made of you know what???? I was so happy the sun was shining, the birds were singing, and the leaves were turning red and gold. I do love this time of the year. All of the boiling hot days have gone, plus the world looks very pretty. Granny said to go out side I might find something. Well I found a nest with all these tiny eggs in. Then saw a bunny eating carrots. I asked Granny if I could have chocolate for Breakfast. She said because it was a very special day I could. But not to expect it tomorrow. Granny told me the egg is the symbol for new life, and that is what Easter is all about. I might just keep a couple of my Easter eggs to see what new life might come. Look this little chick just popped out of one of these eggs. May be more little chocolates will pop out of my blue eggs? Happy Easter to every one. I think I will just have a warm drink of milk before bed tonight my tummy is full. I will see you all next week. 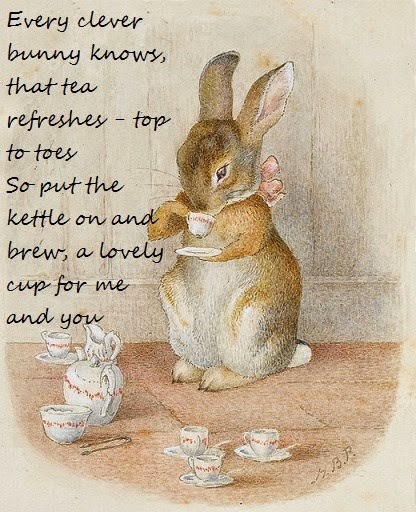 To all my followers, I would love you to have tea with me. Granny will put the kettle on. Welcome to Simona from Spain. "The meaning of life is to find your gift. The purpose of life is to give it away." We think you should give it a try... wouldn't it be nice if this would work... growing even more chocolate from chocolate eggs? *yummy* And in case this plan should fail you could still eat them... a true case of a win-win-situation. Happy Easter to Granny and you, dear Wilbur! A Happy Happy Easter to you both! It looks like you are having a lovely day and a very successful Egg hunt! Happy Easter from our family to your family. Happy Easter dear Wilbur and your Granny! It is nice to see you´ve found a lot of chocolat eggs! And Congratulations to your win at tzhis place too. Wilbur, please tell your Granny she should write me you adress.So your new bunny friend can start his looong travel to you to the other side of the world soon. Wünsche auch Frohe Ostern in das schöne Australien und viel Spass beim Eiersuchen. Gratulation auch zum Candygewinn und der süße Hase von Melli wird sich bestimmt sehr wohl fühlen. Er hat zwar eine lange Reise vor sich, aber ich würde sofort tauschen und an seiner Stelle reisen. 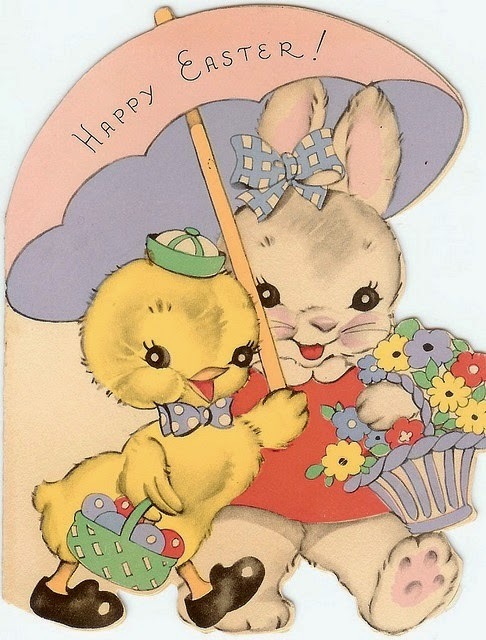 Happy Easter Kay and Wilbur - sorry I am a little late but spending time with my family and have just got around to saying hello. Glad that you got a bunny - one time of the year when it is good to like chocolate. Obviously my first comment did not go through... my connection stalled. You seem to have had a lovely Easter Sunday with chocolates and all. Love your post and great story! HI Wilbur, you lucky son of a gun. All that chocklit! Be careful you don't eat it all at once, you don't want to make yourself icky, and in any case if you eat them all at the same time there won't be any for when you're feeling peckish, or a wee bit sad so that a chocklit is just the thing to make you smile. We sure hope those eggs hatch and produce more chockies, that would be extra super duper. yours Teddy Bears are very beautiful! Your style I love very, very few, rare blogs are like yours. Beauty and sensitivity that I love it! Thank you for touching my heart with pictures and things written.